You can ride switch all day long, throw down corked threes in the big pipe, you’ve dropped the cross on Mount Tallac, won a race or two during gay week and skied Powderhouse in the full moon! Yep pretty hot, right? Well let me tell you about two of my favorite skiers first and then we can take a vote. The first one was born Jon Tostensen, April 30 1827 in the Telemark region of Norway. By the age of ten his family had moved to the western U.S. eventually Jon settled in the Sacramento valley for a life of farming and took on the more Americanized last name Thompson. It didn’t take long for Jon to grow restless, a Norwegian mountain boy trying to live the farming life in the flat lands! So one day he answered a government ad looking for someone to run mail back and forth during the winter months between Placerville and the mining district of Genoa western Utah, now of course Nevada. There were of course no other takers, surely this would be suicide! Others had tried in the past using wagons and horses or mules but had failed miserably, one was even killed by Indians. That would have been those Washoe out there trying to protect their powder runs right? Jon remembered his parents carving long wooden snowshoes and teaching him how to get around in any type of snow that covered the hills. So he set out to carve himself a pair of “modern” snowshoes. He cut an Oak tree and started carving. During the 19th century the word skis was not in use yet, they were called snowshoes, and the pair Jon had made for himself were ten feet long and weighed twenty five pounds! Along with them he carved a single staff with a point on one end which would be carried and used to help push, turn, stop and generally balance. During the winter of 1856 Jon made his first trip from Placerville up the American River Canyon following much of the Highway 50 route of today, over Echo Summit to Meyers then up and over Luther Pass to Hope Valley, down Woodfords Canyon and on to Genoa, 90 miles. The legend of Snowshoe Thompson was born. Snowshoe Thompson made the round trip 2 or 3 times a month during the winter months no matter what the weather was doing. He carried 60 to 80 pounds of mail, sometimes ore samples from the mines back to California and even hard goods up to the miners who were ecstatic to have this mailman as their lifeline to the rest of the world! He didn’t carry a blanket or even a heavy jacket, no weapons and no navigational gear, it would all just slow him down. The trip took three days each way. Snowshoe Thompson skied that and few other routes over the Sierra for twenty years until his death in 1876 and he claimed that he never got lost! Now that’s a skier. 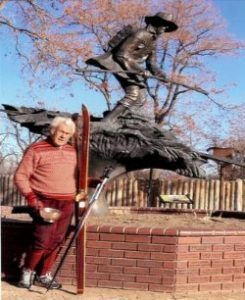 I could easily go on about Snowshoe Thompson’s rich history especially since he is thought to be the person that brought skiing to the Sierras. But there isn’t room today for that since there is a tie in here with the person that is my favorite skier, Martin Hollay. Martin was born in 1920 in Hungary. By 1957 he was living in L.A. (another of those yuk moments) when the Per Gint Norwegian ski club brought him to Mammoth in January for a combined cross country race and jumping competition. 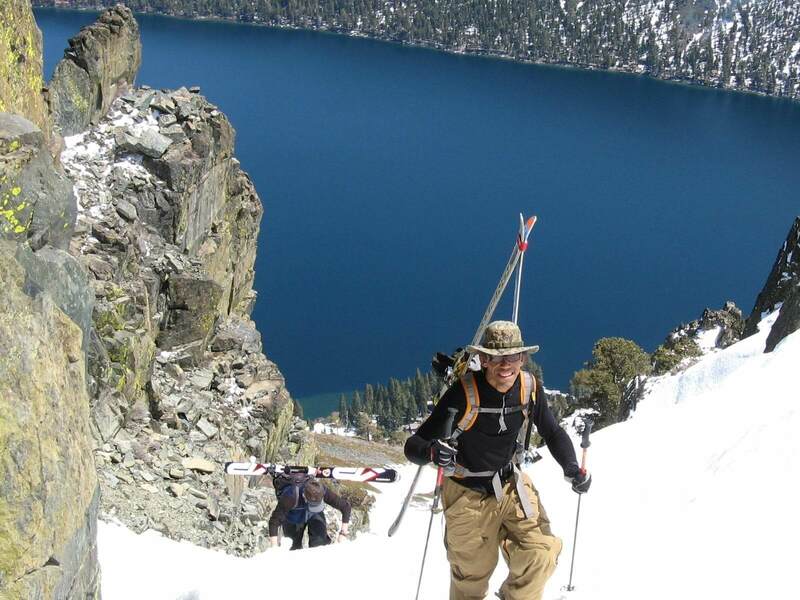 They must have realized they had some talent in this young man because in February they brought him to Tahoe to do the Snowshoe Thompson race which went from Camp Sacramento to Heavenly Valley, a race of 20 miles. In this first race Martin got second, beat by a Finnish competitor, but the following year Martin got him. But when Martin passed the finish line he had to run off to work since he was now living here. Martin was working at Squaw Valley and parking cars at Harvey’s on the weekend (yep, they even did that back then). When he got to work at Harvey’s his supervisor came walking in with the Silver cup, first place prize for winning the Snowshoe Thompson race! It was such a big deal that Harvey Gross, owner of the casino, came down to get a picture with the victor. Well instantly everybody wanted Martin to work with them. For a short while he worked at the Ski Run Lodge which sat where the Ski Run Center and Red Hut sit today. Then he met Stein Erickson and was hired on at Heavenly to help clear trees for the West Bowl run and blast large rocks off of the Face run. At the time Heavenly only had two rope tows at the bottom, the Gunbarrel chair and one rope tow above that. Then in 1959 Martin was hired to help design and build the courses for the cross country races for the upcoming Olympics at Squaw Valley. A few years later Martin became a full time ski patroller at Heavenly Valley and had quite a lot to do with the building of our little neighborhood hill. Martin is now 90, and skis everyday at Heavenly. You may have seen him there if you get there early enough; it’s hard to beat him to that first chair in the morning! As for the Snowshoe Thompson race, it has gone through a number of changes too. I believe it is now put on by the Auburn Ski Club at a different location. But even more important than that, The Friends of Snowshoe Thompson which includes another of my favorite ski people, Nina MacLeod, were instrumental in building and dedicating the monument to old Jon built in Genoa as seen in the photo with Martin holding his 1958 prize cup. Long live the real skiers!